decibel meter app for my iphone driving around. Car seems to say pretty consistent in the cabin. If you are attempting to assemble an authentic appearing 1972 Group 4 engine, duplicating those built by Bud Moore Engineering, the GTS headers would be the correct ones. He doesn't mention, Pat Michal, the headers on his web page, but as far as I know he is the only one who has bothered to build a real collector into the GTS headers? A 3" collector is necessary to make the headers scavenge. That is one of the benefits of fabricated tube headers. It would be interesting to add a thread to this on what the decibel level readings are that everyone is getting from their systems, EVEN STOCK! With the availability of the free sound level apps for smart phones, this is a piece of cake. At this point just saying, stock, a little louder, etc, can be put into numbers so that EVERYONE has a reference to what can and can not be done sound wise? I'm getting flack from people who are just looking at the exhausts and telling me they are illegal. They haven't even heard them run. I don't know where that is coming from since I keep looking high and low and can't find one violation in the statutes. 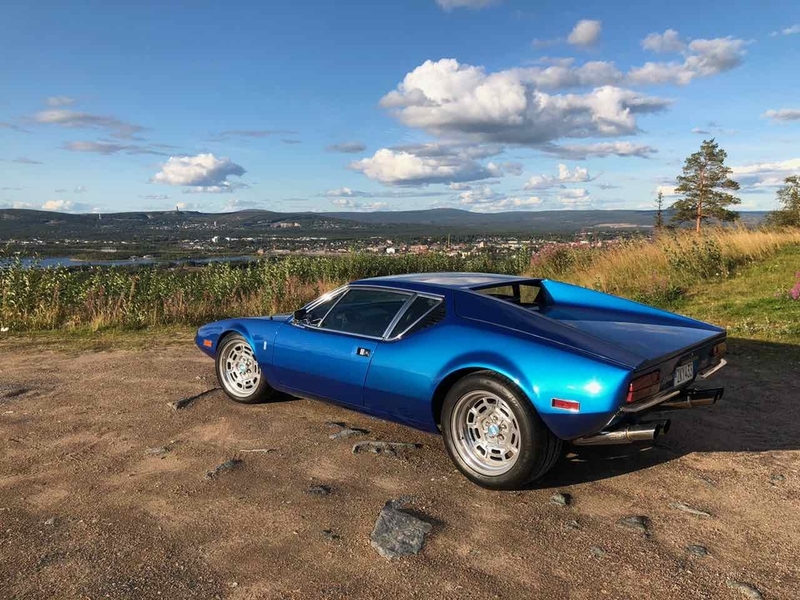 It might simply be that people don't believe this is a production '73 model year car? They want to know where the catalytic converters and the air pump is? Anyone out there that has experienced being stopped for "roadside examination" on their cars like the CHiPs still do occasionally in CA? Here are my headers ... They are supposed to be GTS ones ? anybody to identify my exhaust please ? Well, they are not stock. They look rougher than my GTS headers. Mine may have been repops. They did not have the tooling marks in the tubes like yours do. They maybe original factory gts headers by the original vendor? They are definitely tri-y's. As such they are giving away about 30hp on the top end but provide more low end torque off of idle. They work best on a basically stock engine. They do not work well on a high performance/race engine. Doug, I haven't had any problems with CHP in So.Cal. I drive both my 67 mustangs and pantera on weekends mostly. No issues what so ever with the CHP. The BAR does set up a road side random smog inspection complete with dyno but I have read that its voluntary. I suspect it will get more and more difficult to drive these cars as the years pass. 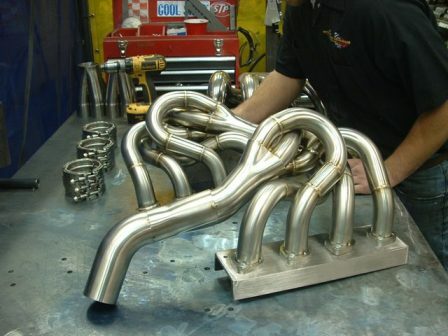 Does anyone know the actual primary tube diameter of the Wilkinson headers and also the diameter of the exhaust pipes? I have read and heard conflicting measurements. Thanks. tail pipes are about 2-3/8" OD. George is correct on the primaries. The exhaust pipes are actually 60mm (2.362"); tail pipes (tips) are 70mm (2.75"). Wilkinson also sold (as a set) stainless steel headers and mufflers. These were also available in mild steel. Primaries are 45mm (1.77"); exhaust pipes are 60mm (2.362"); tail pipes (tips) are 3". I don't know what he is currently selling. Thanks John. How is the quality of his stainless exhaust? I visited Steve recently. He is out of stock on his exhaust system presently. How is the quality of his stainless exhaust? It seems to be ok. As with any polished SS exhaust, it will require occasional cleaning. As a reminder, always make sure that the flange is FLAT before bolting the headers to the cyl head. It is good to know that the Wilkinson exhaust is decent, however the system is sold as a whole, and I don't want the headers. I have tentative plans to make a custom stepped stainless header with a 3" collector and a 2.75" choke. Stainless Headers built a set for one of my other cars and did a great job. As stainless exhaust goes, it requires alote of maintenance, but if the intention is to build 180,s, stainless radiates alote of heat! I don't recognize the application of those headers? What are they for? Maybe, but I don't think so? I have a set of those here. This is what the mounting flange looks like. These are Halls that bolt to the stock Pantera exhausts. The important thing is the shape. Those generally show the obstructions they need to clear. I hope this helps on the sound question. you are right Doug, but I was basing my conclusion on the mounting holes, it is obvious they leaked. I think they may have started as 4V. 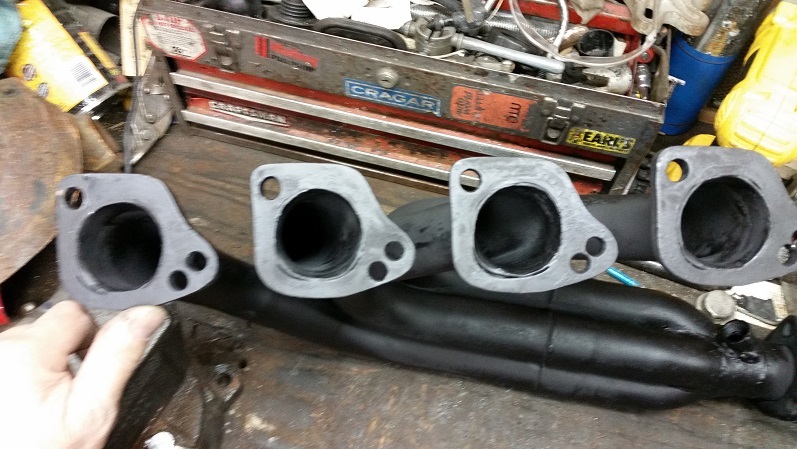 Those are F355 headers. They replicated the factory headers in 321 s/s. They then modified the factory clamshell that covers these headers since the primary pipes that they used were slightly bigger than OEM. VERY LITTLE bolts up to those heads. Headers would not without adapeter plates, but why bother? In a Pantera, just get the right headers. Stainless headers are absolutely beautiful new but I like the ceramic coated steel better. Just take some Windex and wipe them down. If you want to go crazy, buff them with Mothers wheel polish. The ceramic maybe will get a little dull if you are running lean and super heating them but even then they wind up looking like "mill polish" stainless. 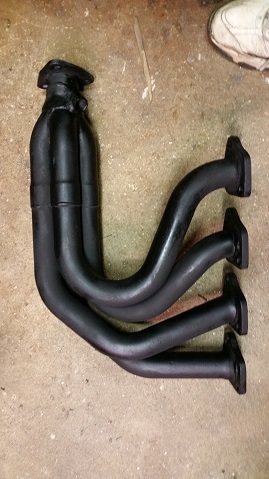 i`m planning to wrap my Hall headers (as in PanteraDoug`s post) with basalt fibre to reduce heat in my engine bay. Especcially the pipe coming very close to the oil filter concerns me a bit. Does anyone have experience, how much and what material to use? Do you ever drive the car in the rain? ...I Second this. I have been told by more than one Experienced Source, that 'Wrapping' Header Tubes....Yes, Keeps Some Heat from concentrating in the Engine Bay, 'It' also keeps the Header, itself, from 'Cooling', Therefore Accelerating Disintegration of the Steel. Plus, It Looks Like Crap, In My Opinion. So Go For It! If Your worried about the Oil Filter taking Heat, change to a Remote Filter System. Also think about the Fuel System winding around/near the Header. On my race car exhaust I only used wrap where there were no other options. Likely the exhaust temps are higher with a race engine but it was very evident that the wrapped parts deteriorated much quicker than the exposed pipe. I built “air blades” or simple shields where possible which actually worked better anyway. For street use coated helps a lot. Recommend getting the headers Jet Hot (or similar) coated. Makes a huge difference in temperatures. My headers are cool enough to touch within 5 minutes of turning the car off. I have read through this whole thread and kudos to you guys who fab up your own 180 degree headers. I think I am going to stick with the under the car approach. The improved sound would be the major advantage for me on the 180 degree route, but I really like how easy it is to get to the engine, plugs, etc. I don't think I want to give that up for sound. Actually getting to the plugs isn't that difficult with 180s. The only issue is you have to jack the car up to slide underneath. Hi this is a picture of my OBX R mufflers, sounds great.